This article explains how to start saving to Pocket when using apps to find content on your iPhone. The primary method for saving is with our Share Extension, but there are other methods that can be used as well. In most cases, you’ll be able to save to Pocket in just a couple taps. The Pocket Share Extension is a button that can be easily added to the default iOS Share Menu. This will make saving to Pocket easy from any app that displays this menu after tapping the Share button. To use the Pocket Share Extension, you’ll need to enable it first. Please visit the following article to learn how to enable and use the share extension. Facebook for iOS is popular app that does not use the default iOS Share Menu. Click here to learn about the easiest methods for saving from Facebook to Pocket. If you’re using an app that doesn’t use the default iOS Share Menu you can copy the link and then open Pocket. 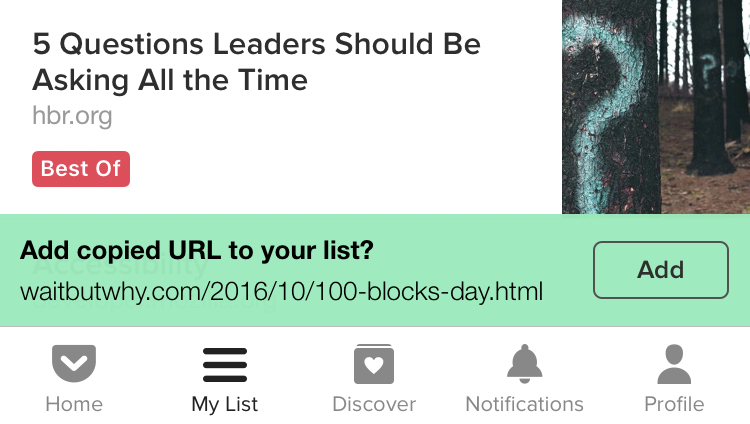 The copied URL will be detected and you’ll see a banner to save the page to your List. Click here to learn about saving copied links to Pocket. Have an iPhone with 3D Touch support? You can save a copied link by simply using 3D Touch on the Pocket app icon! Click here to learn more about 3D Touch Quick Actions on iOS. 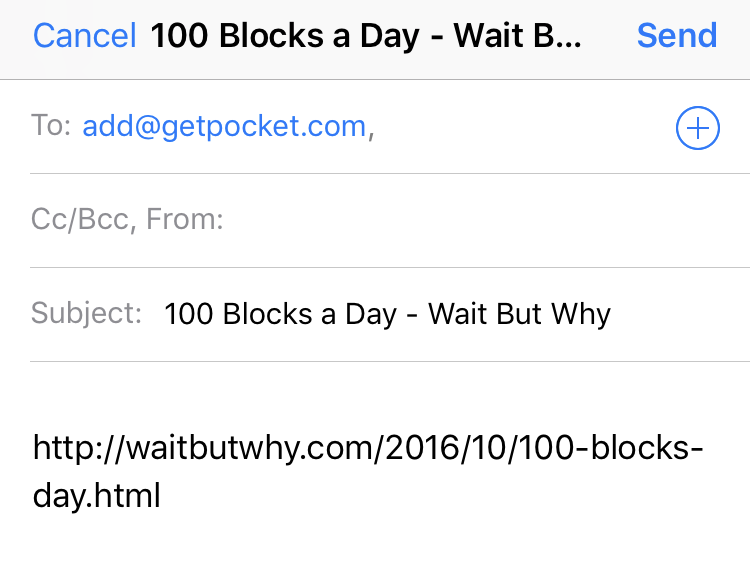 Another easy way to save a link to Pocket is to simply send it in an email to add@getpocket.com. Once Pocket receives this email, we'll process it and add the included link to your List automatically! Click here to learn about saving to Pocket email.